Samford University’s School of Health Professions received a $250,000 gift from Encompass Health Corporation, formerly known as HealthSouth, to endow a scholarship for minority students who are inspired to follow their calling to serve others through health professions, positively influencing health care and society. Doctor of Physical Therapy (D.P.T.) students Hans Rice, Eric Gonzalez Diaz and Joy Dees are the inaugural recipients of the Encompass Health Minority Scholarship, and the impact of this scholarship can already be seen in their lives. Rice, a third year D.P.T. student, attended Samford as an undergraduate student, graduating with a Bachelor of Science in exercise science. When he began to look for physical therapy programs, Rice knew he wanted to return to Samford as a member of the program’s inaugural cohort. “Samford revitalized my life, so I knew I wanted to go to a program that helped me become a better person,” Rice said. For Rice, the scholarship means more than the monetary value. “From the situation I come from, anything goes a long way. But in this instance, it’s not the monetary value that is the most important. It’s an honor to just be a recipient. What this scholarship stands for is the most important thing to me,” he said. Joy Dees, a first year D.P.T. student, said she chose Samford for graduate school because of its commitment to missions and service learning. “That is what attracted me to the program. I really have a heart for missions, and I love getting to do service learning projects as part of my curriculum,” she said. For Eric Gonzalez Diaz, a second year D.P.T. student, the scholarship comes as a financial relief for his family, as his wife works to not only support him but also their 3-year-old daughter. When asked what he would want to say to Encompass Health, knowing their gift made this scholarship a reality, he said, “I would want to tell them thank you for their generous donation and their contributions to our community. While this scholarship seeks to make an impact amongst minority communities, I see its greatest purpose. This scholarship has directly impacted my family,” Diaz said. While Encompass Health made the transformative gift, the desire for this scholarship has been on the heart of Alan Jung, dean of the School of Health Professions, for years. “It brings me incredible joy to see this scholarship become a reality, and to witness how it is already impacting the lives of the students who have received it. My hope is this fund will continue to grow so we can expand the reach and the impact of the scholarship,” Jung said. This year’s scholarship recipients are three D.P.T. students, but the award is open to any student in the School of Health Professions. "The inaugural recipients of the Encompass Health Minority Scholarship are a group of talented individuals who also demonstrate compassion for serving others through health care professions,” said Cheryl Levy, chief human resources officer of Encompass Health. 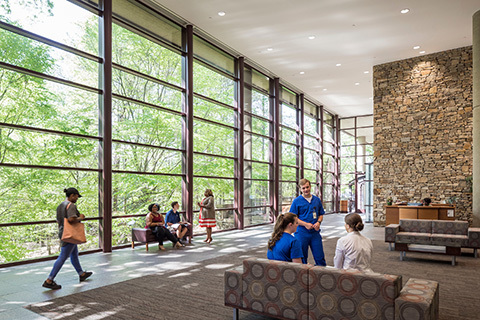 “As a leader in post-acute care, we applaud those who choose a career in helping people heal and regain independence, and we look forward to seeing how this fund can benefit others in years to come."